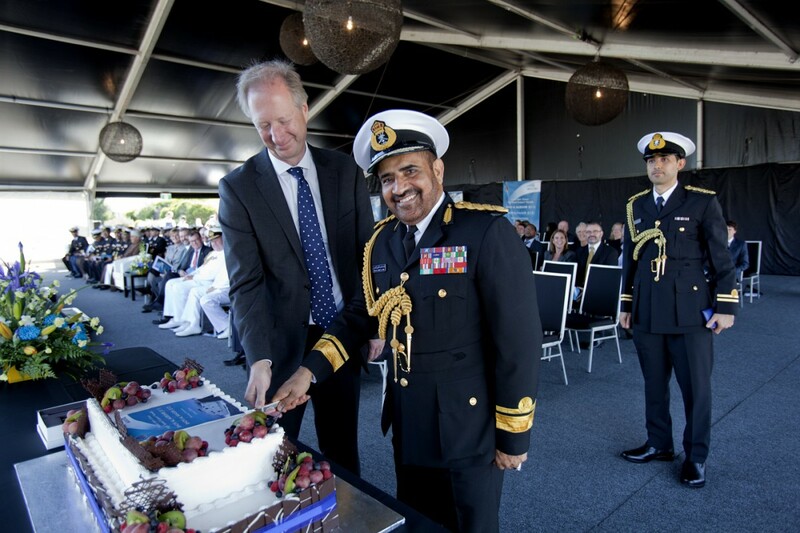 Austal has today welcomed the Commander of the Royal Navy of Oman (CRNO), Rear-Admiral (RADM) Abdullah bin Khamis bin Abdullah Al Raisi to the company’s Australian shipyard in Henderson, Western Australia, to officially name two 72 metre High Speed Support Vessels (HSSV’s) designed and built by Austal for the Royal Navy of Oman (RNO). In a formal ceremony, RADM Abdullah bin Khamis bin Abdullah Al Raisi named the ships RNOV AL MUBSHIR (S11) and RNOV AL NAASIR (S12). 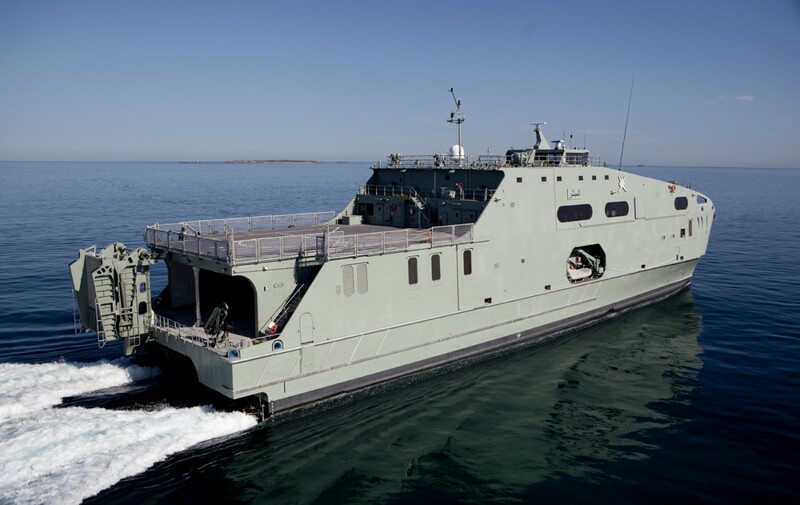 The 72m High Speed Support Vessel (HSSV) RNOV AL MUBSHIR (S11) during sea trials off Western Australia, March 2016. The first vessel – RNOV AL MUBSHIR (S11) – is on schedule for delivery in the first half of 2016; whilst the second vessel – RNOV AL NAASIR – was launched this month and shall be delivered following further fitout, sea trials and acceptance in the second half of 2016. 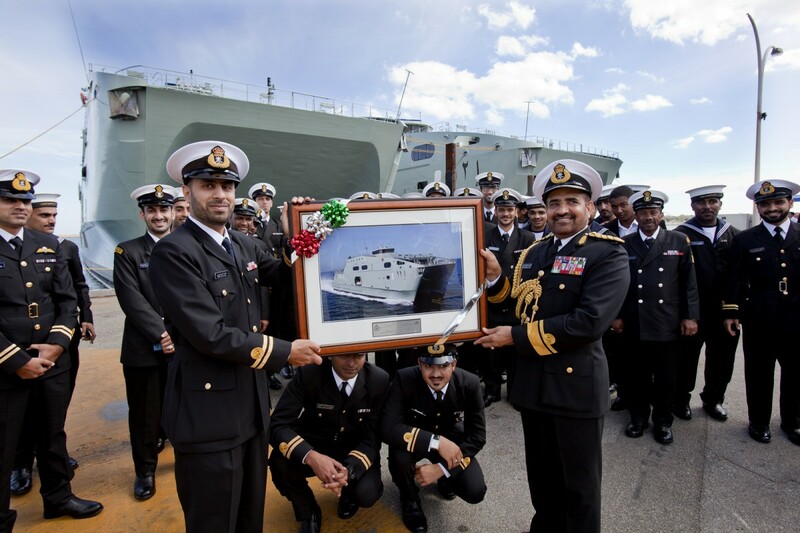 RNOV AL NAASIR (S12) launched at Austal’s Henderson Western Australia shipyard in April 2016. 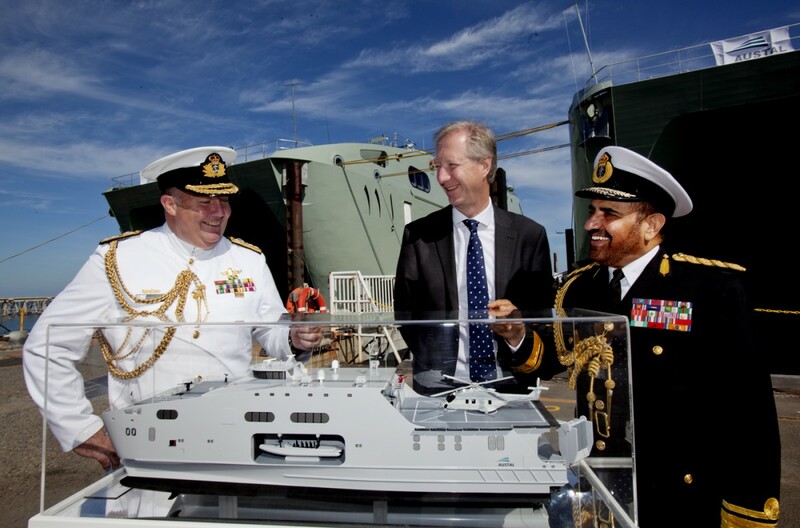 Austal commenced construction of the two HSSV’s in August 2014, following the award of the US$124.9million contract from the RNO in March 2014. The unique first-of-class naval vessels are an evolution of the proven Expeditionary Fast Transport (EPF) platform, developed for the United States Navy by Austal, now operating around the world with US Military Sealift Command. The innovative design offers high speed performance, multiple-mission capability and operational flexibility and demonstrates Austal’s industry-leading ability to develop unique, customised naval solutions based on proven designs, for export markets. The 38 knot, all-aluminium HSSV offers exceptional speed, manoeuvrability and carrying capacity (for up to 260 embarked troops and equipment and vehicles) – for a range of military operations and logistics support roles. Featuring a shallow draft of 3 metres, a 900sqm vehicle deck, 395 tonne carrying capacity and medium-lift aviation capability (for a NH-90 helicopter), the HSSV provides support for both open ocean and coastal missions. Newly-appointed Austal Chief Executive Officer, David Singleton congratulated RADM Abdullah bin Khamis bin Abdullah Al Raisi on the RNO’s strategic investment in the innovative HSSV platform - and confirmed that Austal shall provide in-service support to the RNO and the two HSSV’s through the company’s Middle East Service Centre in Muscat, Oman.